Over the years I have done many of these summer events in “well-preserved Baroque town,” either as part of competitions for young organists (both as a player and a judge), or in tourist concerts from the North Sea to the Thuringian forest. Next summer already beckons with one such jaunt from the city of Norden in the northwest corner of Germany to perhaps the most visually sumptuous of all organs, that in the Benedictine Abbey in Weingarten not far from Lake Constance in the south. For the tourist these concerts offer not only a cultural focal point amidst aimless days, but also a portal into a glorious German past before the horrors of the twentieth century. These concerts can also present a good opportunity to get drunk. This became clear to me some years back when I played a mid-week August concert in the town of Haringe in West Flanders in Belgium about a kilometer from the French border. Aside from the immaculately maintained World War I cemetery—final resting place to 750 British soldiers; another thirty or so from Australia, Canada, New Zealand, and South Africa; and about forty Germans— Haringe boasts a large Romanesque church whose grandeur seems out of portion to the village itself. The church in turn is adorned with a beautiful organ from 1778 built on a grand wooden balcony. Having put in my time playing historic organs in tiny villages at similar venues across northern Europe usually for a few sunburnt tourists, local pensioners, and rabid organ audiophiles armed with the latest recording equipment, I was astounded when Haringe’s church filled to capacity—several hundred strong—on a Wednesday evening in August for a program of music from the Age of Enlightenment and Revolution. After the apocalyptic conclusion of Mozart’s Fantasia in F Minor, K. 608, a piece from the last year of the composer’s life and one shot through with both the light and dark side of his genius—the audience jumped up for a standing ovation. As it turned out, this display of collective enthusiasm had less to do with the shattering onrush of the contrapuntal forces Mozart had unleashed on the vast and terrifying musical plain of the Fantasia (the piece had been commissioned to be heard in a Vienna waxworks mausoleum in which an effigy of General Laudon, the scourge of the Turks at the Battle of Belgrade, was laid out) than with the famed Haringe Organ Beer that was to flow freely in the village hall across from the church after the concert. West Flanders is still home to some 400 breweries that serve up extremely potent stuff. Haringe’s is particularly beloved of vacationing city folk from Brussels who, while spending a week or two on the Belgian coast, punctuate their holidays with an hour of organ music and plentiful amounts of beer drunk out of glasses embossed with an image of one the organ case angels entwined with hops and holding an organ pipe. Aside from taking note of this highly effective way of bolstering attendance at organ concerts—one we have introduced on several successful occasions in Ithaca, New York with the deliciously ingenious and fortifying help of Hopshire Farm and Brewery—the main message of these post-concert revels become clear to me as the concert-goers staggered to their cars: avoid driving on the mortal back roads of West Flanders in the pre-midnight hours after a Haringe organ recital. Rather than traipsing across Europe this August, I’ve staid put in Upstate New York and let the organ tourists come to me. Organists and builders pass through the region and want to look at, listen to, and play on the now-famous Baroque organ in the University’s Anabel Taylor Chapel. Aside from these individuals passers-through, this month brought with it the annual conference of the Organ Historical Society, an organization founded more than fifty years ago and unified by its members’ love of, and loyalty to, the King of instruments. “Historical” means different things in different places, and the group’s focus on organ building in North America shortens the timeframe considerably from the European scale. Over there the oldest still-playable organs predate Columbus’ voyage. 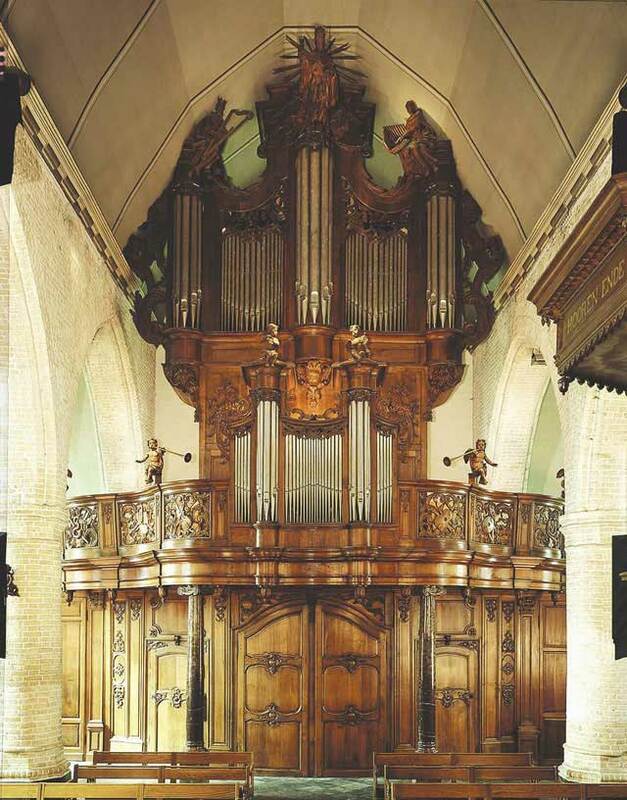 Still, there are many excellent exemplars of the organ art as it flourished on this side of the Atlantic over the last two centuries, from modest country stock to opulent urbanites. And then there are those instruments, like the one finished in 2011 at Anabel Taylor, that are newly made but based on much older organs: history becomes not only a topic of study but of reenactment. Cornell’s newest organ is also its oldest—a kind of reconstruction of an instrument by celebrated German maker Arp Schnitger that, like so many of his creations, was destroyed in World War II. More than three hundred members of the Organ Historical Society signed up for the convention and arrived here Wednesday morning in buses from Syracuse, an hour’s drive away. The OHS is an aging group, though there was a contingent of at least a dozen twenty-somethings. As a whole this younger generation did not inspire great confidence in a rejuvenated future for the organization, since many of them spent most of the evening concert given at another of Cornell’s organs thumbing away on their iPhones. It was not the steep hills of Ithaca that slowed down the progress of the conventioneers through the day’s events, but rather a filibuster at the annual business meeting in which some crank expounded for the better part of an hour on the necessity of forming a new committee to spread the news to churches across the land that carpet was a terrible thing since it saps the acoustical might of the organ. The afternoon was half gone by the time the fanatic was finally muted, perhaps muffled in a carpet and dumped in Lake Cayuga below the bluffs on which the university spreads. Because of the relatively large numbers attending the convention and the modest size of the chapel in which Cornell’s Baroque organ is housed, I was to play the concert three times in succession. I began the first recital not for the full-capacity audience of a hundred that I had expected but a much smaller group of about two dozen. When I looked over the balcony at the end of the program the place was packed. I then learned of the delay caused by the carpet crank. The crowd demanded a reprise of the first piece—a turbulent Fantasia and Fugue by Carl Phillpp Emanuel Bach. Partially placated, organ historicists shuffled out of the carpetless chapel to the next stage of their round robin afternoon hearing the various Cornell organs. By the third run through the now massively delayed program my mind had departed the premises and the performance proceeded according to my default settings. It all reminded of those endless loops one gets into at the organ waiting for a theatrically tardy bride to enter the church at long last. Paradoxically it might seem this last autopilot performance was the best of the lot. Often it’s better not to think at all but let things roll on—and that counts not just for concerts. I found myself, even amidst some very demanding music, recollecting organ adventures of yore: cross country walks towards distant churches; dank staircases up to organ cases etched with ancient graffiti; keyboards touched by Bach; pipes heard by him; the Midsummer sun disappearing through high lead-glass windows. As the last of the three Organ Historical Society audiences made its way out of the chapel, it occurred to me that it is useful to stay home and be overrun by visitors. It stokes the desire for further travels.